Manganese X Energy Corp. (TSXV:MN) is a Canadian based company focused on acquiring and advancing North American resource projects with the potential to supply ethically-sourced value-added materials to the lithium-ion battery and renewable energy technology markets. Currently, there are no operating manganese producers in North America and the market is awaiting more reliable, sustainable sources of material outside of China. The company’s flagship project is the Battery Hill property located in the top-tier global mining jurisdiction of New Brunswick, Canada, and under option from Globex Mining Enterprises. Battery Hill hosts carbonate manganese, which is necessary for the production of electrolytic manganese dioxide (EMD), a high-value product with a purity of 99.7 percent used in the cathode material of nickel-manganese-cobalt (NMC) batteries. NMC batteries are a type-of lithium-ion battery with considerably less cobalt, which is more expensive and more volatile than the more traditionally-used lithium-cobalt oxide battery. NMC-based lithium-ion batteries are increasingly replacing the lithium-cobalt oxide batteries in electric vehicles (EVs), portable devices and renewable energy storage systems as a more cost-effective and safer alternative with a longer life cycle. LG Chem (KRX:051910), the world’s largest supplier of EV batteries, supplies NMC batteries for plug-in hybrid vehicles, including the Chevy Volt. Tesla (NASDAQ:TSLA) has said it will use NMC-based cathodes in grid batteries its planning to produce at their gigafactory. In December 2016, Manganese X signed an agreement with Kingston Process Metallurgy (KPM) to conduct an EMD concept study to explore the company’s options for enhancing manganese for the lithium-ion battery industry and maximizing the added-value potential of the Battery Hill property. Following the recommendations outlined in the report, the company has implemented laboratory-scale leaching tests to determine the manganese recovery and sulphuric acid consumption. Manganese X has also acquired the 1,985-hectare Peter Lake copper-nickel-cobalt property in Mont-Laurier Terrane, Quebec. To date, the property has seen little exploration, but the exploration that has been conducted outlined two zones of mineralization. Historical grab samples from these areas returned values that range from 0.4 percent to 22.8 percent copper, 0.14 percent to 0.73 percent nickel and 500 ppm to 0.226 percent cobalt as well as elevated gold and silver. Advancing Battery Hill towards a NI 43-101 resource estimate. Both Canada and the U.S. import 100 percent of their manganese requirements; North American companies are keen to source manganese supplies outside of China. Technology companies and consumers increasingly require ethically and sustainably sourced materials. Only pure-play EMD company listed in Canada. Battery Hill hosts carbonate manganese which is necessary for the production of EMD. Agreement with KPM to study Battery Hill’s potential to supply EMD to the lithium-ion battery industry. Manganese values in the chip samples ranged from 0.72 percent to 25.97 percent manganese oxide and from 7.74 percent to 33.37 percent iron oxide. New Brunswick government support and grants through the New Brunswick Junior Mining Assistance Program (NBJMAP). Peter Lake has historical grab samples that returned values of up to 22.8 percent copper, 0.73 percent nickel and 0.226 percent cobalt. Technology division develops cost-competitive purification techniques for the production of high-purity manganese sulphate. Technical and marketing advisory board provides guidance in regards to becoming a leading supplier of ethically-sourced, value-added manganese products. Partnerships in place with the Canadian National Research Council and the University of Minnesota. Will receive monthly dividends from Mountain Springs Oil and Gas Limited. EV sales are expected to increase from $1.1 million in 2017 to $11 million in 2025. Solar panels are following a similar curve at around 50 percent growth each year. This surge in demand is expected to translate into increased demand for manganese as battery makers and end-users look for alternatives to using cobalt. Additionally, 90 percent of the world’s available manganese is used in steel production, making it a valuable metal in multiple industries. “It is management’s opinion that the price trend of manganese as well as the value-added products derived from manganese such as electrolytic manganese dioxide may continue to be robust due to the increased demand especially from lithium-ion battery storage units specifically for electric vehicles,” said Manganese X CEO Martin Kepman. By completing this form, you are giving consent to receive communication from Manganese X Energy Corp using the contact information you provide. And remember you can unsubscribe at any time. The Battery Hill property is located five kilometers northwest of the town of Woodstock, New Brunswick, one of Canada’s top mining jurisdictions and among the top ten in the world, according to Fraser Institute’s annual mining survey. In June 2016, Manganese X signed an option agreement with Globex to earn a 100-percent interest in the 1,228-hectare property. Existing infrastructure includes road access to the property, close proximity to major highways and railway and available energy and water sources. The property encompasses five manganese-iron zones including Iron Ore Hill, Moody Hill, Sharpe Farm, Maple Hill and Wakefield. These zones are the northern portion of the Smyrna Hills Formation, a banded iron formation consisting of an interlayered sequence of manganese minerals including rhodochrosite (a carbonate) that extends across the US border into the state of Maine where similar iron-manganese deposits are found. Carbonate manganese is the source material for the production of EMD, a high value product used in the cathode material of NMC-based lithium-ion batteries. The Woodstock area was once home to an iron-manganese mine in operation for nearly 40 years beginning in 1848 supplying high quality material for use in the amour plating of Britain’s Royal Navy gun-boats. In December 2016, Manganese X signed an agreement with Kingston Process Metallurgy (KPM) to conduct an EMD concept study to explore the company’s options for enhancing manganese for the lithium-ion battery industry and maximizing the added value potential of the Battery Hill property. In May 2018, Manganese X received the results and final recommendations of the concept study. Following the recommendations outlined in the report, the company has implemented laboratory-scale leaching tests to determine the manganese recovery and sulphuric acid consumption. “We are encouraged by the results which now give us a detailed roadmap to create Canada’s first high grade manganese product which could potentially supply the North American and worldwide lithium ion battery industries,” said Kepman. In the fall of 2016, the company completed gravity and magnetometer surveys across the Iron Ore Hill, Sharpe Farm and Moody Hill zones. The results of the surveys guided the team in determining targets for a winter drill program totaling 3,589 meters in 16 holes which was completed in December 2016. In April 2017, Manganese X conducted a 1,600-meter drill program on the Battery Hill deposit with the intent to investigate and establish key structural markers such as dip, true thickness and folding before the company launched their resource-focused summer drill program. Their efforts focused on the Sharpe and Moody Hill sectors. Results from the program included a true width of 54.1 meters with grades of up to 18.4 percent manganese oxide were encountered on the property. In February 2018, the company completed a preliminary geological model on the project. The model was completed with the intent to establish the potential magnitude of the Moody Hill, Sharpe Farm and Iron Ore Hill as a single target and to define any additional exploratory work needed to be done before the completion of a resource. The study examined the results from Manganese X’s 5,188 meters of drilling that was completed between November 2016 and June 2017 and identified six areas that require further drilling. As for the combined target, the study outlined a target that potentially ranged in size from 14 million to 31 million tonnes grading up to 10 percent manganese and up to 14 percent iron. Moving forward, Manganese X is looking towards developing a maiden resource estimate for the property that will include all of the currently recognized mineralized zones. In August 2018, Manganese X acquired the 1,985-hectare Peter Lake copper-nickel-cobalt property in Mont-Laurier Terrane, Quebec. 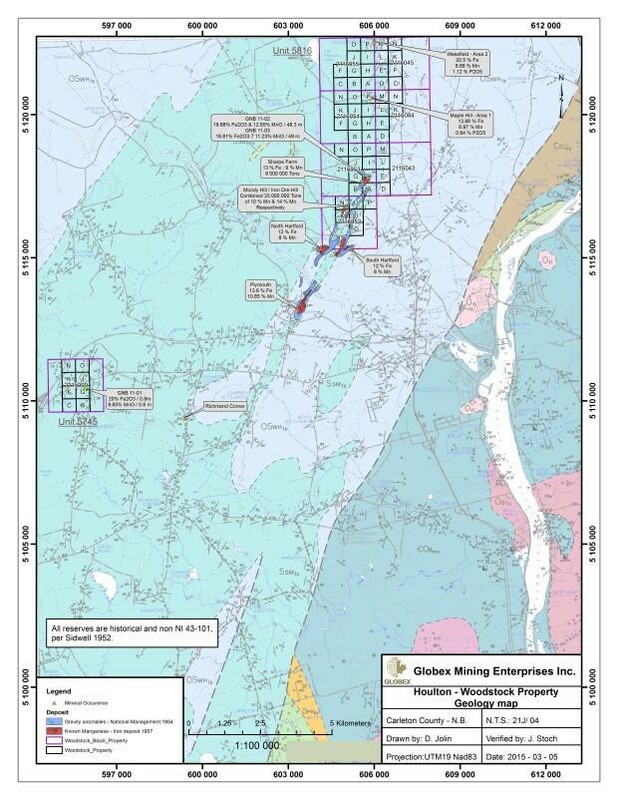 The property is located 20 kilometers south of Kintavar Exploration Inc.’s (TSXV:KTR) Mitchi project, where there has been new copper, silver and gold mineralization discovered. To date, the property has seen very little exploration work. However, the property does host two copper-nickel-cobalt occurrences, known as Peter Lake North and Peter Lake South. Grab sampling from these areas has returned values that range from 0.4 percent to 22.8 percent copper, 0.14 percent to 0.73 percent nickel and 500 ppm to 0.226 percent cobalt as well as elevated gold and silver. In 2002, two shallow drill holes were completed on the property. Ten years later, a discovery was made at the Peter Lake South occurrence, but the discovery has not undergone follow up drilling. Manganese X’s 2018 work program consists of line cutting, ground geophysics, prospecting and trenching over areas of known mineralization in particular. Preliminary blast results from eight of the nine samples taken from the Pater Lake North and South occurrences and graded 5.38 percent copper, 0.96 percent nickel and 922 ppm cobalt. In September 2017, Manganese X entered into a confidentiality agreement with the University of Minnesota to assist in the development of value-added manganese products. The company intends to develop new technological methodologies and cost-effective innovations and will continue to work with prominent manganese engineering companies that have already been engaged for their various other metallurgical projects. “We believe that having the University of Minnesota on board along with our team of experts will enhance tremendously and expedite our development of our Battery Hill Woodstock New Brunswick manganese property, with the intent of being the first North American supplier of value added materials to the lithium ion battery and other alternative energy industries, as well as the steel industry” stated Manganese X CEO Martin Kepman. In July 2018, Manganese X received a proposal from the Canadian National Research Council to test the potential of ore upgrading and purification techniques in order to be able to produce battery-grade material. The test work will be completed under the direction of the NRC Mineral Processing Team. In October 2018, Manganese X acquired a 25 percent interest in Mountain Springs Oil and Gas Limited, a privately owned Canadian oil and gas company. Mountain Springs has contracted Schlumberger Limited, an oil and gas services company, to utilize their new technology that has been shown to increase oil and gas yields. Mountain Springs recently acquired its first oil and gas company in western Canada. Their acquisition currently yields approximately $235,000 per month or $2.8 million per year prior to the implementation of Schlumberger Heal Systems Technology. Mountain Springs is currently in the process of completing a second larger acquisition. Manganese X will receive monthly dividends that the company intends to use to finance the exploration and development of their Battery Hills project and to reduce dilution to their shareholders. Martin Kepman has over three decades of consulting experience across a broad scope of projects in multiple industries ranging from software, soft goods, printing, food to mining. He is the owner and president of Martin Kepman and Associates Inc., a business development and management consulting firm founded in 1982. Roger Dahn has over 30 years’ experience in the mining and exploration industry. His experience includes over 16 years with Noranda Inc. and Hemlo Gold Mines Inc., as well as serving in the roles of Exploration Manager-Eastern Canada for Battle Mountain Gold Company and as Vice President-Exploration with Olympus Pacific Minerals Inc. and most recently Tri-Star Resources plc. He has been involved with a number of base metal and gold discoveries which advanced to development stage and production. His extensive mineral exploration experience covers both Canadian and International settings. Jacques Arsenault is an experienced executive and consultant who for more than 20 years has specialized in the development, restructuring, acquisition, merger and sale of companies and assets in both the public and private arenas. Mark Billings is the Chairman and Chief Executive Officer of Canamex Resources Corp. (TSX-V: CSQ). He recently served from 2007 to 2014 as a Director, Senior Vice-President of Corporate Development and Chief Financial Officer of Argex Titanium Inc. (TSX: RGX), a company he co-founded. Steve Roebuck is a registered professional geoscientist with over 25 years of international mining and exploration experience. Roebuck is currently the President and CEO of Natan Resources Corp. Most recently he was the President of Scorpio Gold Corp., a 40,000-ounce-per-year gold producer with assets in Nevada. Dr. Luisa Moreno, has over 12 years of experience in technical and economic research, with unparalleled expertise in strategic minerals and related processes. Dr. Moreno is currently Co-founder and Managing Partner at Tahuti Global. Prior to this, she spent seven years as a Financial and Senior Equity Analyst at Canadian Financial Research and Investment Banking firms, including four years covering the specialized field of industrial minerals within the metals and mining sector of these firms. Dr. Moreno possesses strong insight into materials processing and metallurgy of industrial and precious metals and an astute understanding of supply and demand dynamics. She has published a number of advanced technical reports on key strategic materials, and is a sought-after consultant to numerous mining and processing companies as well as industrial end-users. Dr. Moreno is a Physics Engineer with a Ph.D. in Materials Science and Mechanics from Imperial College London, in the UK. Shimmy Posen is a lawyer at Garfinkle Biderman LLP, where he focuses on corporate finance, M&A and securities law. He acts for public and private companies, securities dealers and financial institutions on a number of public and private financings and commercial transactions. *Disclaimer: The profile provides information which was sourced and approved by Manganese X Energy in order to help investors learn more about the company. Manganese X Energy is a client of the Investing News Network (INN). The company’s campaign fees pay for INN to create and update this profile page, to which links are placed on Investingnews.com and channel newsletters.